These recycled binders are very durable and more resistant to spine-tearing than the traditional vinyl binders. 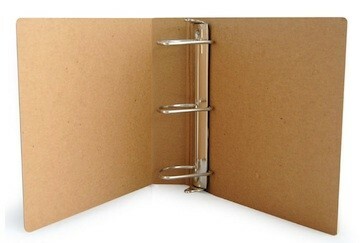 It is truly recyclable and reusable because it is a corrugated cardboard binder. Vinyl binders are neither recyclable nor reusable. Unlike vinyl binders that use rivets to attach their ring metals, these have ring metals that are affixed using two screws and t-nuts that can be reused without any waste. We believe it's unlikely you'll ever need to replace your binder cover, but if you do, it can be recycled back into the system and kept out of the landfill. Process(ed) Chlorine Free (PCF)Applies to post-consumer recycled content only as it means that no chorine (or compounds) were used this time around but there may be traces of chlorine present because of earlier processes which where not of our own production process to make sustainable papers.Post-Consumer Material (PCW) Waste paper that has served its intended purpose and has been separated from solid waste to be recycled into new paper. This is what you and I take to the recycling center. Post-Consumer Material: (PCW) Waste paper that has served its intended purpose and has been separated from solid waste to be recycled into new paper. Quite commonly, it is simply the garbage that individuals routinely discard, either in a waste receptacle or a dump, or by littering, incinerating.